Who is Jack Hirschman, Poet Laureate of San Francisco? Last Thursday, 72-year-old San Franciscan Jack Hirschman was inaugurated as the fourth Poet Laureate of San Francisco, and several stories have already been written about Jack, but all have presented only a two-dimensional image of the real person. That Jack supported Matt Gonzalez for mayor, that he’s lived an alternative lifestyle (the Chronicle story used “bohemian,” a word that went out of style in the 1960s), that he’s published numerous books — all have been mentioned in the various accounts. When our newest Poet Laureate speaks, his thick East Coast accent gives him away to reveal his New York roots, where he was born in 1933. Jack moved to San Francisco in 1973 after a brief university teaching career he left in the 1960s. But who is Jack Hirschman? Jack Hirschman is a passionate social justice activist who shares with his friends his warmth and affection. He opens his heart in discussions to share his feelings about the injustices of the world, and offers a hug when you greet him and a hug when he leaves. Whenever I talk with Jack and the subject matter steers to poetry, Jack expresses his admiration for the three San Francisco Poet Laureates who preceded him, but he is most fond of 86-year-old Lawrence Ferlinghetti who he speaks of with reverence. soon if, and who cares? reknowned for its food and culture. that’s become a national circus of the damned. We want the empty offices collecting dust! We want the movie houses from midnite til dawn! We want the churches opened 24 gods a day! We built them. They’re ours. We want them! with enough to live on! on a crutch on a rainy sidewalk. When I talked with Jack on Thursday night, he noted that while the mayor may have stated he commends those who disagree with him, Jack and I disagreed on our perceptions of how the mayor deals with criticism. Jack feels the mayor easily deals with critiques, but it has been my experience that Mayor Newsom has great difficulty dealing with criticism, indeed, is incapable of understanding contentiousness and is taken aback when so confronted. But one thing Jack and I agreed on is that Newsom probably knows very little about poetry and hence his reliance on the senior William Newsom for advice on picking Jack for the position of Poet Laureate of San Francisco. While the position is symbolic, Jack feels it is a tremendous honor and was and still is excited about representing San Francisco and feels the honor is a victory for working-class people of The City. Additionally, Jack leaked inside information to me that there might just be a possibility of him receiving a small honorarium for his position. And as Poet Laureate of San Francisco, Jack Hirschman wants to organize an International Poetry Festival of San Francisco and invite other social justice activists worldwide to participate. Jack’s first thought for a location was the Palace of Fine Arts. 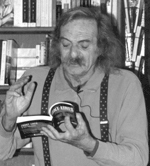 To learn more about Jack Hirschman, visit LRNA.org, where you will also find an email link to request Jack’s presence at an event you are planning. I know Jack would be thrilled to speak so don’t feel hesitant about inviting him. In April, the League of Revolutionaries for a New America will be presenting Speakers for a New America, and Jack will be among the scheduled speakers. Finally, my thanks to Tony Robles of Manilatown Heritage Foundation for introducing me to Jack, and congratulations to Jack Hirschman, Poet Laureate of San Francisco — his poetry and his deep, booming voice sound the call for social justice for all.